Escape from the Bronx is the sequel to 1990: The Bronx Warriors and once again stars Mark Gregory as a nearly mute gang member named Trash who struggles to make ends meet by selling ammunition to the cowering denizens of the Bronx while the General Construction Corporation’s Disinfestor squads dress like Mercury-era astronauts and roam the landscape killing anyone they find. Trash is content to live in this wasteland until he returns home to find his parents have been killed by the Disinfestors, which leads to him teaming up with a journalist (played by David di Donatello Award-winning actress Valeria D’Obici), a professional bank robber, and the robber’s 10-year-old son, who just so happens to be a demolitions expert, to kidnap the president of the GC Corporation. Meanwhile, the remnants of the gangs have unified under the control of a man named Dablone (affectionately called Toblerone in the Mystery Science Theater 3000 version of the movie. Yes, there is an MST3K version of this movie, under the name Escape 2000), a man who speaks with an accent and appears to laugh randomly. And the Disinfestors are being led by an ex-prison warden known for his cruelty and totally willing to commit genocide, who happens to be played by Henry Silva. So what happens when all of these people meet? Still, what did I expect from a movie where the good guys all have infinite ammo and somebody found out how to fund pyrotechnics? Trash shoots down a helicopter and blows up a van by shooting at them with a revolver. 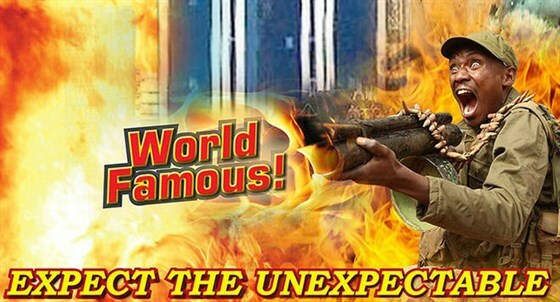 He also narrowly survives a harrowing scene where a ladder nearly falls on him…and then explodes! And a lot of people take flamethrowers to the face in this film. It’s quite thrilling, despite how much Trash just stands around and stares at things. The connections between this movie and the previous are a little odd. The evil CEO of the GC Corporation is the same guy who was running the Manhattan Corporation of the previous film. Trash has a new motorcycle but still has the skull from his old one mounted on it. And some of the gang members return and appear in the motley crew of Brooklyn survivors, though funny enough the largest group appears to be that weird dance troupe from the previous film. I guess nobody took them seriously enough to try to kill them. But the hodgepodge of survivors features a random assortment of gang members from the first film, so I have to give them credit for going for some level of continuity. In the end, not much really gets resolved here. A bunch of folks die, the Disinfestors are defeated, and the GC Corporation gets a new president who will likely continue the exact same policy. It all just feels like a pointless exercise. But with explosions.